There once was a very slow detective, who had a mind that was shallow and defective. But then, one night, to his, delight, a hero saved him from a rogue collective. Want to know more? Then please ignore the following adventure created by Joshua Williamson, Guillem March, Rafael Sandoval, and published by DC Comics in March, 2019. TO QUOTE David Suzuki: ‘We're in a giant car heading towards a brick wall and everyone's arguing over where they're going to sit’. Over the last day or so, Gotham Girl has gone on a mad rampage and smashed, bashed, and slashed everything that has crossed her path. 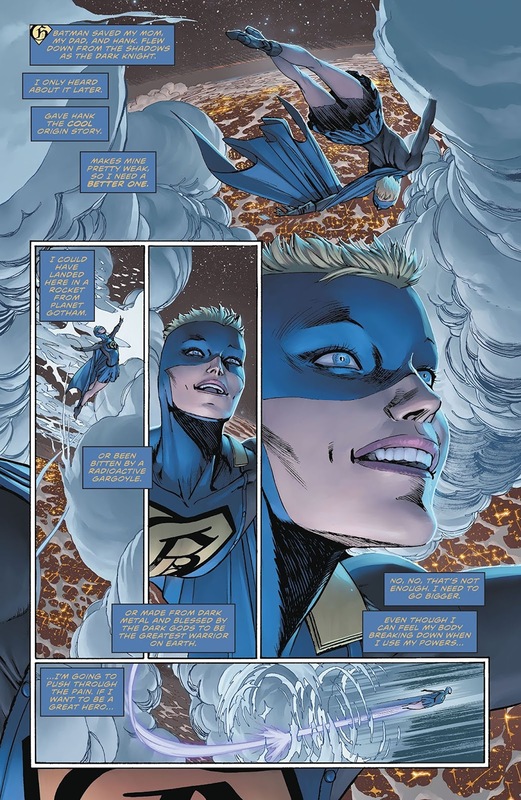 This includes destroying the Flash Museum, staging an attack on Batman and his super-fast ally, Barry Allen, and with some help from her dead brother, Hank, she’s even blown-up half of downtown Central City. Part One) THE GRAVE AND THE MOULD: Can someone please explain to me what DC Comics are currently playing at? I mean, there they are, with a large selection of legendary characters under their belt, and for some unexplained reason, they kill them off, make them look bad, dilute their personalities, or try to pit them against each other for the sake of setting-up another storyline. 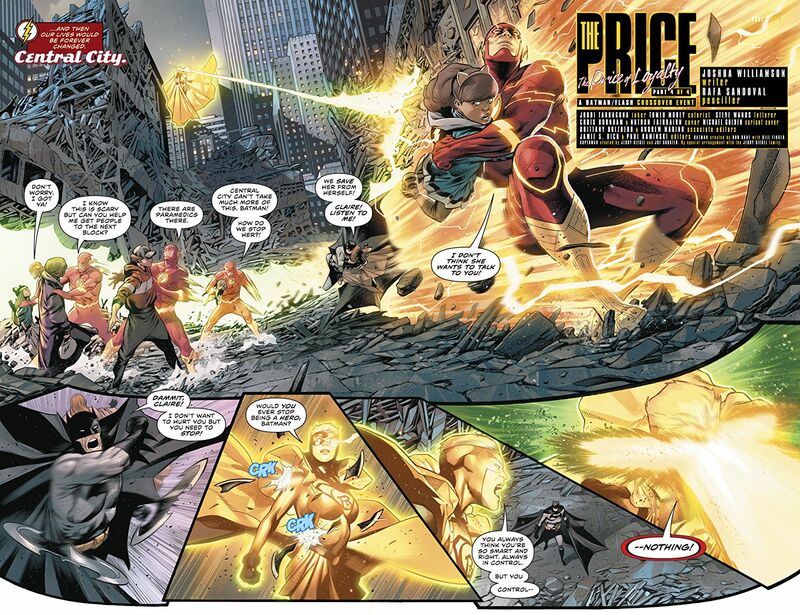 Like this one did, for instance, because it basically establishes a new conflict between Bruce and Barry! Why did they do this though? Why did DC decide to make these two heroes into enemies when they actually have quite a lot in common? After all, they’re both friends, they’re both detectives, and they both share a slightly similar superhero origin steeped in death and tragedy! What’s more, they’re also members of the exact same team, the Justice League, and they regularly have problems with their respective friends and foes! So, with all that said, why the split, and what would it ultimately accomplish? Apart from turning the DCU into another reality TV show populated by villains, heroes, and staged events! Come to think of it, there wasn’t much point to the Gotham Girl subplot either! Not only because of the lack of information pertaining to the mysterious villain behind her unusual behavior, but in addition to this, once the boys started to argue with each other, the overall storyline quickly shifted gear and focused on showing them slowly ruining their relationship. And trust me, folks, they really do ruin their relationship, big time, with either side throwing harsh words of anger and threats of violence, left, right, and center. Primarily from Barry, which seems a bit strange, considering he’s the happier one out of the two and far less complicated. As a matter of fact, it seems so oddly strange, I’d go so far as to say that it was completely out of character and appeared fairly false within these proceedings. Well, let’s face it; Barry isn’t totally innocent when it comes down to how he handled Wally coping with his grief. So, seeing him now blaming his death on Batman and the other members of the Trinity, despite the fact that they tried to help, feels slightly hypocritical somehow, misplaced even, and the same thing can also be said about Iris’s reaction as well. But then again, that’s loss for you, isn’t it? As you can never really tell how someone is going to react to the death of a loved one. Especially a loved one who literally popped up out of the blue and didn’t really have enough time to shine in the spotlight! Damn you, DC! Why are you doing this? Why are you doing this to Wally, Bruce, and Barry? And don’t give me any of that hogwash about trying to tell creative and imaginative stories the likes of which they’ve never told before. If anything, this whole event feels like a sham, a pretense, and came across as one-dimensional as Gotham Girl’s portrayal throughout the entire crossover. Part Two) DIVORCE OR DIVERSITY: That said, however, there were certain sections within this four-part adventure which gave it a slight edge compared to some of the others published by DC. 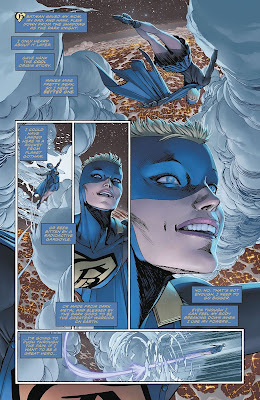 For a start, the artwork by Guillem March and Rafael Sandoval was bold, dynamic, large, and very vibrant on the page, and in some cases actually sold the emotional intensity that certain characters were going through. Like Iris, for instance, when she angrily slapped Batman in the face for the death of her nephew, Wally! Or for that matter, when Barry aptly avoided those obstacles and attempted to punch the Dark Knight at super-speed! Actually, these sequences were so powerful and so moving to follow, the rest of the story paled in comparison because it didn’t seem to have the same amount of emotional depth. Heck, just take a look at the initial fight scene featured near the start of issue 65 of Batman, as all that accomplished was to show two bold figures quickly dispatching an army of un-dead nobodies for the sake of padding out the page-count! Similar, in fact, to the so-called surprise guest appearance made by Hank Clover, a.k.a. Gotham, who basically showed up on page 12 and then died 5 pages later! Well, let’s be honest here, was he even needed? No. I don’t think so. And to some extent, I can say exactly the same thing about this crossover as well! 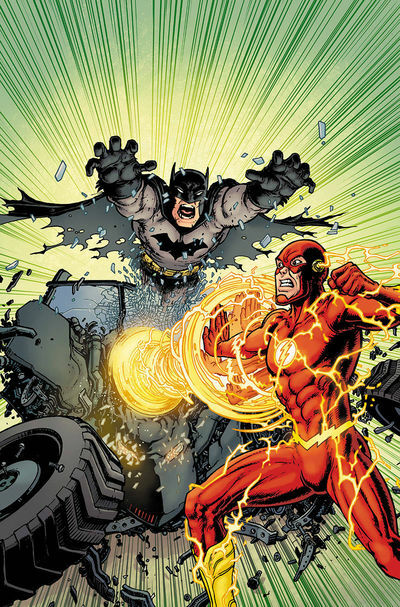 It wasn’t needed, and I’m sure we could have seen Batman and The Flash’s argument featured in the ‘Heroes in Crisis’ miniseries. So what do you think, dear reader? Do you think that I’m being too harsh about this storyline? Or alternatively, do you think that I’m raising some valid points and that my assessment is fairly spot-on? Either way, please keep in mind that everything I’ve just said is meant with all due respect, as I wouldn’t want to offend Joshua Williamson or any of the editorial staff at DC Comics. It’s just that sometimes I can’t help but feel concerned about the current status quo, and all in all, I genuinely dread that a creator's vision can sometimes supersede what's at a character's core. In any event, please feel free to leave your thoughts in the comment section below and tell me what you think about Barry’s split from Bruce and his other half, wink-wink! There were numerous times throughout this adventure where I wanted to take both Barry and Bruce by the hand and force them to listen to the following song. It’s sung by Tina Turner, it’s called, ‘I Don’t Wanna Fight No More, and overall, I think it’s a pretty decent musical match-up and a great song to listen to. Conceptually, this entire crossover was set up in order to make Barry despise Bruce. So, with that in mind, I would now like to compare these comics to a game of wrestling. Ding-Ding! Seconds out, comparison made. Everyone in the entire planet swapping genders. The wedding of Harley Quinn and Nightwing. One of the heroes secretly being a villain. 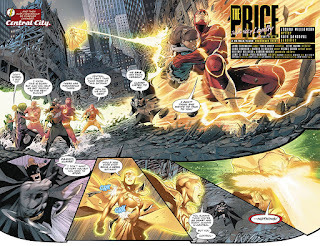 The destruction of the Speed-Force. Nobody being repressed and complaining about it.